This is an older piece of writing, but it’s a long read that was coaxed out of me by an incredible editor and some formidable women in an online writing group. I’ve been looking back on it lately, because it sparked my journey toward the book I’m in the process of launching, though I may not have realized it at the time. This editor and this group asked me how a modern woman could get wrapped up in old stories about long-dead French people. The simple answer was “Because I like those stories.” But the more complicated answer follows in something that amounts to a window into a writer’s soul. I hope you enjoy it, and now that I have the perspective I didn’t have then, I realize there’s a whole new chapter I’m about to write. It starts tonight and I thank you so much for coming along with me on this journey. He seduced me in the rain. It happened in Paris. And at the risk of making this story really French, it happened while my husband attended a conference on the opposite side of town. It happened on a cold September day. We had been in Paris for three days by then, long enough for my four-year-old daughter to decide that the Luxembourg Gardens playground was the only place worth visiting in the entire city. It had that well-worn merry-go-round, that vendor that sold rich hot chocolate, that puppet theater where the characters beat the ever-loving-daylights out of each other with sticks, much to Parisian children’s glee. There were ponies to ride and rope spider webs to climb and big fat pigeons to chase through puddles. It was a veritable kiddie Xanadu, well-shaded by chestnut trees whose leaves were just beginning to turn gold, orange and brown. Although it was understandable why my daughter wanted to be there, it was also problematic, given the weather that day. So I thumbed through a guidebook in hopes of finding something else we could do, something else that might titillate that part of her that loved sparkly, fabulous princess things and fluffy tutus and rainbows worth of color. That should not have been such a difficult thing to find in Paris, France – it’s a pretty gorgeous place — but on this day it was, thanks in no small part to the discernment of my pint-sized companion, who blithely swung her feet back and forth as she nibbled at her pain au chocolat. “I want to go to that park today,” she said. The last time I was in Paris, I was 19 years old. It was my first solo trip outside of the United States. This brings me to the first thing you need to know about me: I have been seduced by a Frenchman before, a fact that is so utterly clichéd that I hate myself for typing it. But alas, it is true, and our romance began the way all great romances begin, with a young French man and a young American woman telling each other they have no earthly idea what the other is talking about. Cut me some slack. I was 19 years old. And that’s exactly what happened. The sick and twisted deal of it all was this: I was rather proud of my seven years of French, and he was rather proud of his 11 million years of English (him being the sophisticated European and all that), but we could always stand to improve ourselves, non? So for months, we sent letters back and forth, each of us torching the other’s efforts to write in our respective mother tongues. We softened the red ink blows with stories about the day to day (yes, right down to what part of the foot he was studying in school) and eventually he wrote to say that his family would like to host me in their home for the summer. This invitation did not sit well with my mother. C’est possible. Then again, I wasn’t the one using The Simpsons episode about the time Bart went off to become a French exchange student and two unscrupulous winemakers turned him into their own personal slave as a cautionary tale. I love you, Mom, but really. Anyway, I spent the summer in Paris, touring museums, looking at art that I had only known from slideshow presentations in class, improving my French, making new friends, eating foods I used to find repulsive and arguing with F. about every topic under the sun. I met Love of His Life over a bouillabaisse feast. And she made no secret of her disdain for The American Girl. F. was quiet through it all. I was mad and then quite drunk. He liked that I was mad. Which, of course, infuriated me even more. Ultimately we did not stay angry with each other. But I also did not stay in France with him because leave-it-all-behind-and-be-with-me style commitment just did not seem like something I could do. Months after I returned to the States to begin my junior year at Louisiana State University, F. had found a serious girlfriend. He called me to ask whether I was jealous. I told him no. I was happy for him. We haven’t spoken since. I did Google him (of course) and know that he has his own private podiatry practice, located in a charming suburb not far from where he grew up. Do I wonder what might have been? No. He and Paris came into my life for a reason, turning me into a slightly braver version of my shy, uncertain self. For that I will always be grateful. “Can we pleeeease go to the park today?” my daughter begged. In some respects, the 36-year-old Paige who sat in Paris with a child who was blind to the weather was not all that different from the 19-year-old Paige who once stood in Notre Dame Cathedral and realized that seven years of French class can only take you so far with a native speaker. This brings me to the second thing you need to know about me: As I sat in a rental apartment on Left Bank with a youngster full of chocolate and a guidebook on my lap, I felt irretrievably lost and unsure of myself, which might have been what made me so vulnerable to yet another Frenchman’s seduction later that rainy day. After years of defining myself as Paige-who-freelances-for-national-magazines-and-newspapers, the market dried up and I became Paige-who-couldn’t-successfully-pitch-a-story-to-save-her-life-and-now-what-do-I-do? I had a handsome, kind husband and a beautiful child and every reason to be happy. And yet I felt like a failure because, try as I might, I wasn’t able to do much of anything with my head or my pen. So when my husband said we should all go to Paris, it was as if a little light inside of me that I feared had been extinguished began to flicker anew. I hoped the journey would be as personally transformative as the one I took when I was a teenager and also wondered what it would be like to see a city I love so much through my daughter’s eyes. I looked down at my guidebook and saw the words “Palais Garnier.” Although I had loved French history as a college undergraduate, I didn’t know a lot about the building, an opulent opera house built in the mid-nineteenth century. But it seemed to have everything I needed to persuade my then-budding ballerina to come along willingly: beautiful artwork, gilded décor, miles of red velvet and the additional selling point of being a place where famous ballerinas have danced (none of whom she would have known, but the promise of fame and tutus holds major sway in a young girl’s imagination). Together, we navigated the Paris Métro to the Opéra stop, and carefully made our way up the steps past fast-moving throngs into the ninth arrondissement. There, we were greeted by golden theatrical masks that smiled down on us from the Garnier’s rooftop. Even in the cool drizzle and mist, the building was breathtaking: ornate Corinthian columns, elegant arches, a symphony of multicolored marble and intricately carved stone. All of it fluttered across the building’s façade, which was emblazoned with winged statues and busts of composers. “Pick me up, Mama,” she begged. Huddled under a cheap black umbrella, I sloshed across the Rue Auber with her in my arms. When we reached the other side of the street, I put her down for an instant so I could switch my too-large-for-that-moment handbag from one shoulder to the other before picking her back up again. That’s when I looked up and saw him for the very first time. He stood still and calm outside the opera’s entrance, a soulful type with artfully tousled hair that framed his piercing eyes and well-chiseled face. Who is he? I wondered. His name was Charles Garnier, he was a famous French architect, and he had been dead almost 110 years by the time I hustled across the street to get a closer look at his statue, which stood outside the opera hall that was his life’s work. When he lured me across the street and into the building that bore his name, the rest, as they say, was history. There was no line for self-guided tour tickets that day. So we paid and wound our way through dimly-lit corridors full of intricately carved stone, past a bronze statue of Pythia, a priestess known as the Oracle of Delphi, and then up slick marble stairs. There were more stairs, after that. Grand ones, familiar ones. Why were these stairs so familiar? Because I had seen a couture-clad Audrey Hepburn stomp down them past Republican Guards in the 1957 Stanley Donen film Funny Face, about a bookish girl who was discovered by a major fashion magazine and then turned into a cover model overnight. It was one of my favorite movies and I was tickled to be standing in the midst of where that particular scene was shot, all the while wondering how Audrey made it down those steps without slipping and breaking her swan-like neck. Then I imagined ladies in crinolines and beautiful gowns, their hair piled high, fanning themselves as they climbed the steps to their seat as admirers watched their grand entrance from the surrounding balconies. This was the grand staircase from the Broadway musical and Gaston Leroux novel The Phantom of the Opera and I had never even made the connection until that point. This building was the backdrop for the world’s longest-running and most iconic musical, a show I hadn’t seen since I was a teenager meeting strange Frenchmen on the beach. This place was gorgeous and opulent and dizzying. I looked down at my daughter as we climbed the staircase together and her mouth was wide open. “What do you think of this place?” I asked her. Whoa was right. I wondered what it would be like to see a performance there, how much it might cost, how fancy you’d have to dress, how much of a scene it all was both on and off the stage. I wondered how you dreamed up something like this, if you were that guy who caught my attention down on Rue Auber. I wondered how much it cost and how long it took to build something this grand. Again, who was this Charles Garnier? “When you do, I will watch you all the time,” I said. We walked around the foyers, underneath more chandeliers and Byzantine-style frescoes that looked like dark, starry nights. We walked and walked and sat on the stairwells and took pictures together, of the ceilings, of the floors, of the blackamoors, of the lighting, of our feet. And then we left. At least I did physically. Mentally, my head was still hovering over the red velvet seats. By dinnertime I was thinking that maybe I wanted to come back to the Palais Garnier and dance too, although not in a ballerina way, but in a nerdy, I-want-to-know-more-about-this way. Because I had a feeling there was a good story there, one that had a lot to do with that statue on Rue Auber. The sun came out the next morning. After breakfast, my daughter and I walked to the Luxembourg Gardens and headed straight for its old wooden merry-go-round. I helped her climb onto a white wooden horse with a pale green bridle, fastened a safety belt around her waist and then paid the attendant, who handed her a foot-long stick she could use to grab rings as she galloped around and around on her steed. I sat down on a green park bench and watched my daughter reach for the rings, sometimes grabbing them successfully, sometimes flinging them through the air. I snapped a few pictures of her, then pulled my guidebook out of my purse, flipping to the pages about the Luxembourg Gardens in hopes of finding out more about this ride. I never managed to read past this sentence: “One of the park’s treasures is its merry-go-round, whose much-loved wooden animals were designed by none other than Charles Garnier, the 19th-century architect of the Paris Opéra.” Rather than read the rest of the entry, I wondered how you went from designing a posh opera to designing a kiddie ride for a park and where I could find a book about this person who had captured my imagination. As the ride slowed to a stop, I realized that maybe, just maybe, I wasn’t as lost as I thought I was. We had been back in the States for a week when I told my husband that I might want to go back to graduate school and might want to study French history, because I was curious about the Palais Garnier and this Charles Garnier person and thought I might want to write about him. “Why can’t you just write about him?” he asked. By this point, my passing interest turned into a full-blown mission. I looked for a biography of Garnier on the internet, but found several books about his architecture. I bought the sole book in English about his work that included a chapter-long treatment of his life, but also a couple of GRE study guides so I could spend the next couple of months cramming for the test I’d need to take to be admitted to graduate school. “I can’t just write about him because I feel like there’s a lot more I need to learn before I can do it,” I said, a response that had as much to do with the nineteenth century as it did with me. Less than a year later, we sold our house in Atlanta and moved back to my native Louisiana where I began studying Modern France under the direction of a professor who had tried to convince me to get a master’s degree in French history when I was an undergraduate. A month after we moved into our new house in the Baton Rouge area, I watched my daughter make her way up the steps of the school bus that would carry her to her first day of kindergarten before I got in the car for my first day of school in fifteen years. By the time I met the twenty-something classmate who introduced himself to me as “not much of a morning person” and sat through a history department orientation with the rest of my soon-to-be-footnoting peers, I began to realize a lot of things, one of which was that I had actually forgotten how to write an academic paper. I walked out of the meeting and down the hallway to my advisor’s office even though he told me the day before that he wasn’t going to be there. Because he knew what was coming. He shut the door and I reached for the Kleenex, which were right where they used to be. And then he went about the ugly business of reminding me that I could do this, that everything would be fine, that I’d see. That was almost seven years ago. The advisor was right. I would be fine. And the seemingly strange, brave step I took on that rainy day in Paris has become one of the best things I ever could have done. For now, I’ve gotten the opportunity to write about a brave young woman who fought against a world that had become unacceptable to her. She’s an inspiration, and I can’t wait to share her story with you. Thank you for that privilege. It’s one I don’t take lightly. Linda Ronstadt’s “When Will I Be Loved?” makes me think of my mother, who in the late 1970s used to blast this song in her pale blue Volkswagen Beetle. She, my sister and I would sing it at the top of our lungs. For Mom, it was a recent divorcee’s anthem, a hard-rocking lament that allowed her to belt out “I’ve been cheated…been mistreated…when will I be loved?” For my sister and me, it was just an opportunity to be loud in the backseat. We wouldn’t know anything about being cheated or mistreated…until, you know, at least our late teens. Songs like these were the soundtrack of my youth, which is why I downloaded Ronstadt’s new memoir Simple Dreams onto my Kindle last week and began devouring it in the carpool line outside of my daughter’s school. So far, the book has gotten a lot of attention due to Ronstadt’s recent revelation that she “can’t sing a note” because she was diagnosed with Parkinson’s Disease. In some circles, the memoir has also been critically panned for the things it did not reveal (i.e. details about drug use, her relationships with high profile men such as California governor Jerry Brown and film director George Lucas and her Parkinson’s diagnosis, which happened after the book went to press). I look at it as one of those bittersweet songs she sang, marked more for its simple beauty than for any bells and whistles an industry focus group may have wanted to inflict on it. 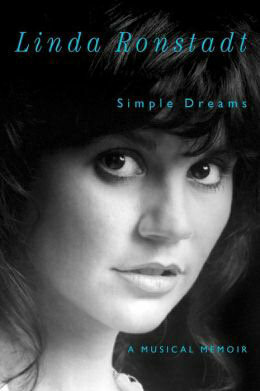 Now that Linda Ronstadt can’t sing, this book is a reminder of the singular voice she had in rock-n-roll and her commitment to pursuing her heart’s desire, even when it didn’t seem to make commercial sense to her record label. For example, who could have known her three-album collaboration with bandleader Nelson Riddle would be the success that it was, or that her album of traditional Mariachi music would be such a global hit? One of my favorite parts of the book was her admission that she felt Emmylou Harris was a far better singer than she was. Ronstadt writes that if she had allowed herself to become jealous of Harris, “it would be painful to listen to her, and I would deny myself the pleasure of it. If I simply surrendered to loving what she did, I could take my rightful place among the other drooling Emmylou fans, and then maybe, just maybe, I might be able to sing with her.” Ronstadt surrendered and she and Harris not only collaborated on a couple of albums, but became great friends too. Nigel John Taylor grew up as a shy only child in working class Birmingham, England. It was the 1960s. His father harbored deep, dark secrets from World War II and poured his heart into working on his car. His mother, who couldn’t drive at all, walked her bespectacled lad to church five days a week. That self-same lad was not a jock, not cool and not sure about what he wanted to be when he grew up. Then the seventies came. When Nigel saw British pop band Roxy Music on television, it was his moon landing. By the end of that decade, he had a best friend named Nick Bates (later Nick Rhodes) who shared his love of music and dream of starting a band. Together they would form Duran Duran, a pop-funk-new wave quintet named after the villain in the futuristic 1968 film “Barbarella.” The band — consisting of keyboardist Rhodes, frontman Simon Le Bon, drummer Roger Taylor, guitarist Andy Taylor and bassist Nigel (who was going by the more rock-n-roll “John” by then) — became the biggest band of the 1980s. Their music was catchy, their videos were decadent, their looks were pin-up boy fabulous. They made a lot of teenaged girls scream. 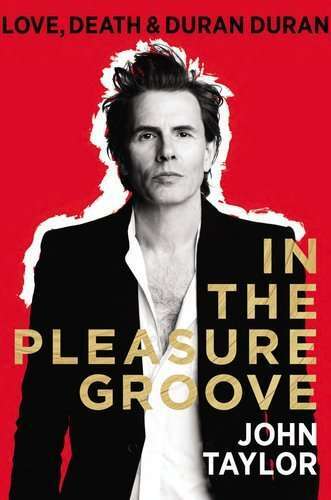 Taylor’s much-anticipated memoir In the Pleasure Groove: Love, Death and Duran Duran came out this Tuesday and I finished it in less than a day. The story, co-written with freelance writer Tom Sykes, is an engaging look at Taylor’s extraordinarily blessed life, which was rooted in the Catholic Church, then the pop music and new wave fashion of the 1970s before rock-n-roll superstardom took him on a wild ride around the globe. In some respects, the story is a conventional “nothing could have prepared me for this” tale, one full of screaming teens rifling through his trash, lines of coke snorted through rolled-up $100 bills, more apartments than he could afford and eventual disillusionment with the business aspects of the band that made him a such a fixture on MTV in the early 1980s. But in other respects, it’s a wonderful look at Taylor’s life, the musical and fashion influences that shaped Duran Duran, the creative opportunities that unfolded because of Duran’s success (i.e. the Bond theme “A View To A Kill,” side projects such as Arcadia and Power Station and involvement in Bob Geldof’s Live Aid), and Taylor’s rocky journey away from addiction. His is a redemptive story, which ends with a stronger and better Duran Duran and a healthier, more grounded Taylor who is able to balance the demands of fame and family life. “The music never sounded better,” he writes. And Taylor’s book couldn’t have been a better read.